As I struggled to keep my footing whilst clambering around in someones front yard (feeling very self-concious for trespassing!) and trying to focus it suddenly occured to me. If this spider fell or moved or jumped at me, I'd probably break my camera trying to get away. Was it really going to be an $800 photo? No, not really. 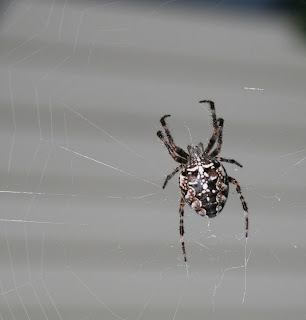 But I've been trying to get photos of spiders for weeks now, this one turned out pretty good. It was such a beautiful day today. What a treat! OK, now whilst that's an amazing shot....can I just say, I HATE SPIDERS!!!!!! I just do!